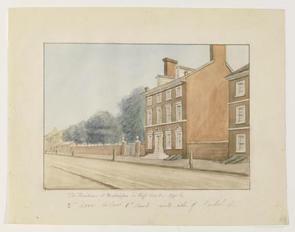 Watercolor of the President's House, 1795. 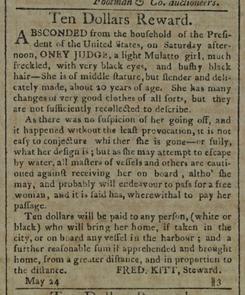 Runaway Advertisement seeking the return of Ona Judge, 1796. George Washington-Tobias Lear Correspondence in Dorothy Twohig et al.,eds. The Papers of George Washington, Presidential Series, vol.6: University of Virginia Press,1996. Lawler,Edward Jr. "The President's House in Philadelphia: The Rediscovery of a Lost Landmark." Pennsylvania Magazine of History and Biography 126 (2002):5-95. Lawler,Edward Jr. "The President's House Revisited." Pennsylvania Magazine of History and Biography 129 (2005):371-410.